We have so many stylish gentlemen to whom we may look when learning to dress. It is a shame that most of them were filmed in black and white, were illustrations in a trade magazine or are dead. The glory days of men’s haberdashery were, in my opinion, the 1930’s. There can be some argument for decades earlier or later, but I think that the 30’s were …er… swell for swells. Which begs the question: if those were the days during which men dressed their best, could we wear those classic styles today without looking like we are in costume? 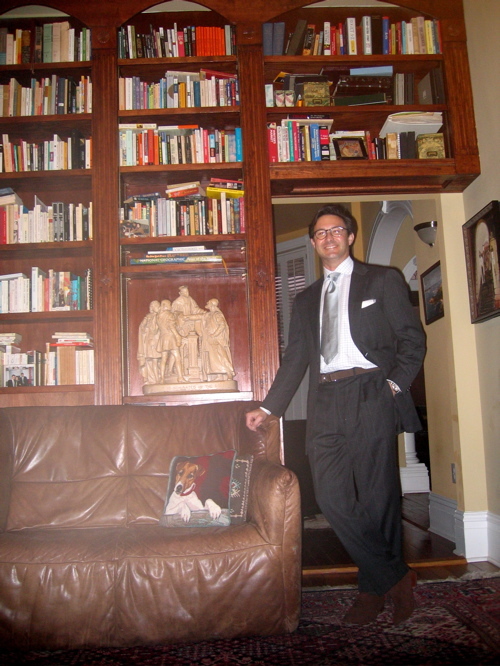 The suit is one that I recently purchased from an eBay vendor and is very a nice Gianluca Barbera. While it is a navy flannel with a windowpane pattern, it is not as aggressively patterned as the Duke’s, above. 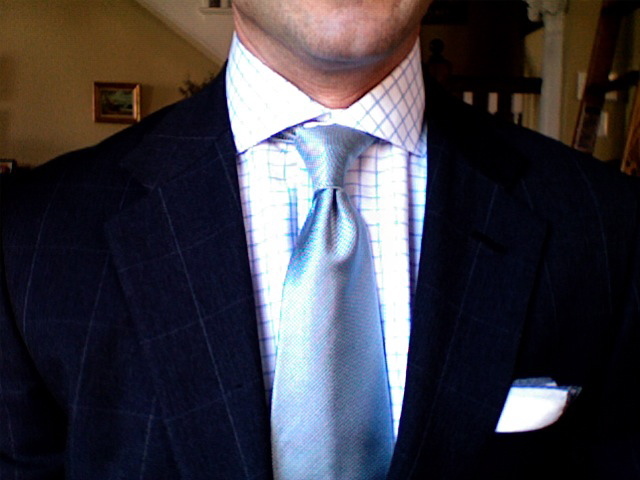 Neither is my shirt, which is a blue tattersall with a cut-away collar. But what helps tone down the pattern on pattern (and keeps it away from costume, in my case) is the solid silver-blue tie (Ben Silver.) I could have chosen a solid navy (even knit) tie, but I like to wear a silver tie whenever I can get away with it. The shoes are also toned down Church’s suede brogues — the light deadening quality of the Cape Buck may have been a poor choice against the soft nap of the flannel, but the Duke was credited with popularizing the suede shoe and so I felt it a fitting tribute. Cultivating a eye for the classic styles of the period between the wars requires some study, some luck and a willingness to stand out a bit. The trick is to stick with well-tailored clothing (the drape cut favoured then will look very loose to us –see the Flusser post, previous.) Hew to the spirit of the look without slavish imitation. Unless you’re being photographed for “Vogue.” In which case, you may do anything you want. 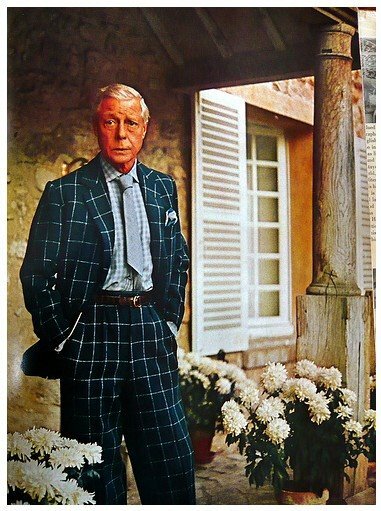 This entry was posted in Cultivating and tagged Duke of Windsor, Vogue. Bookmark the permalink. Your digs are much more current and stylishly classic than the Duke’s. you’re way better looking than he is! The only reason the Duke’s suit works is that he’s wearing it in the country. You couldn’t get away with that in the city. Ever. I agree with Aesthete’s Lament. Very fine suit. I love the Cary Grant silver tie and I also wear one with a white shirt and navy suit on occasion. Well done! AL and Turling, interesting observation. The silver tie is so very formal seeming to me — a city tie — while the suit and shirt combination is very casual. If I remember correctly, he is wearing an alligator belt (and possibly alligator loafers.) I think that they only reason the suit works is because he was who he was! Mr. Lane, a classic combination that goes far. You are quite correct, E&E. The Duke was a sartorial rule to himself and much of what he embraced, clothing-wise, was too extreme for propriety. Though he himself seems to have been quite a stickler for others’ attention to the rules.